For the first time in well over a year, I have started on some models. 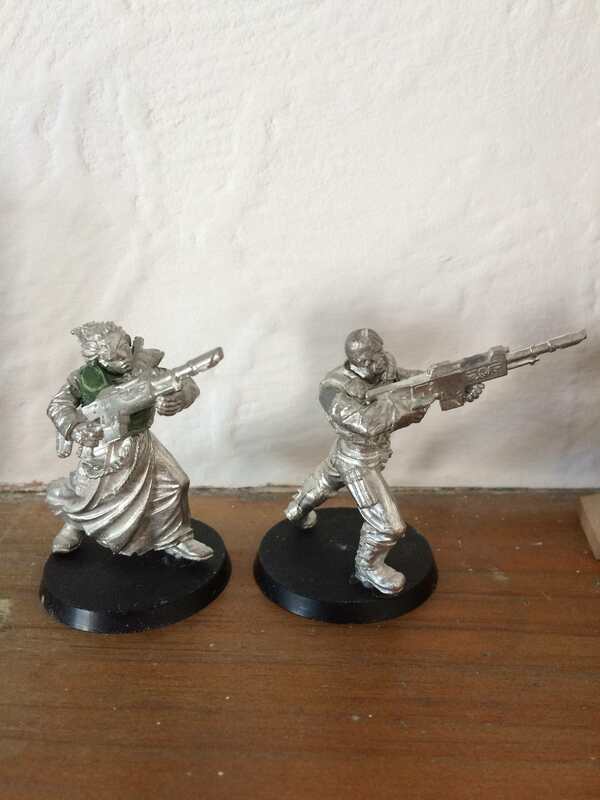 I am putting together members of a Rogue Trader House, that's fortune is founded on slavery. While operating within the law in certain systems, morally they're reprehensible. 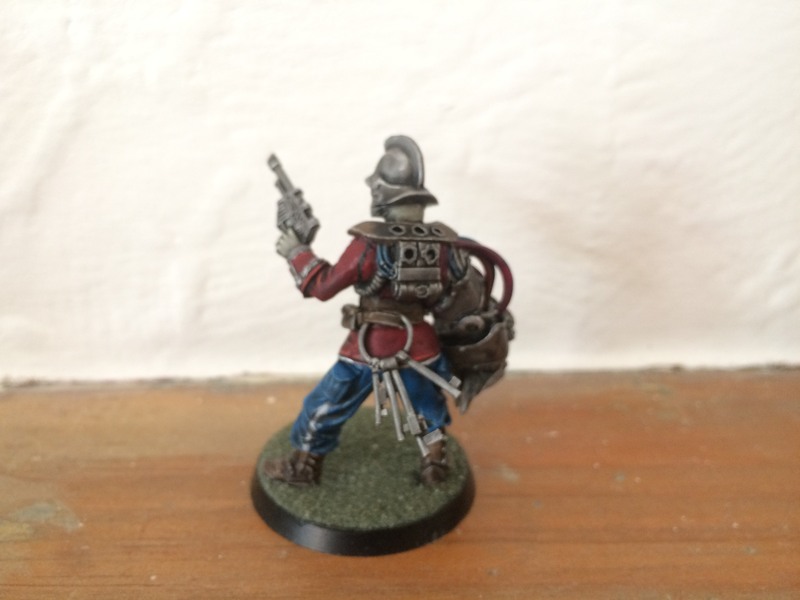 The first model is of an as yet unnamed slaver. His role is to hunt down and collect new slaves, as well as those that have managed to escape. Other models may include foot soldiers, who are slaves themselves with explosive collars, and an official from the house. The mini has parts from Gruss, Jaxon, Tyrus, von Castellan, Kal Jerico, Josef and the head is from a Technolog gladiator. 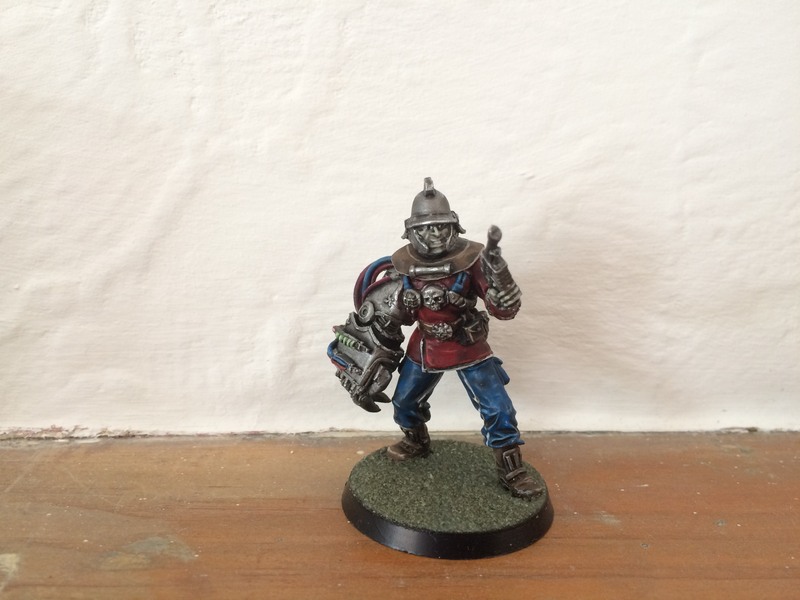 Thought a ceremonial looking helmet would suit an agent of a Rogue Trader House. 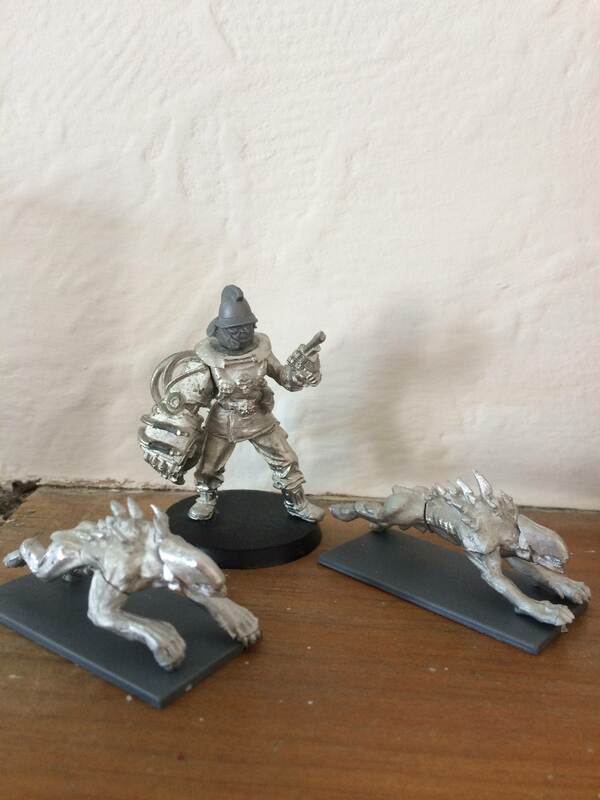 The beasts accompanying the slaver are from Heresy Miniatures. Very interesting. How's the detail on the plastic head? Not ideal. Fortunately the helm has cheek guards that cover a lot of it. Hopefully have some time over the weekend for progress. Once some paint is on the face it should be a bit easier to see how it looks. 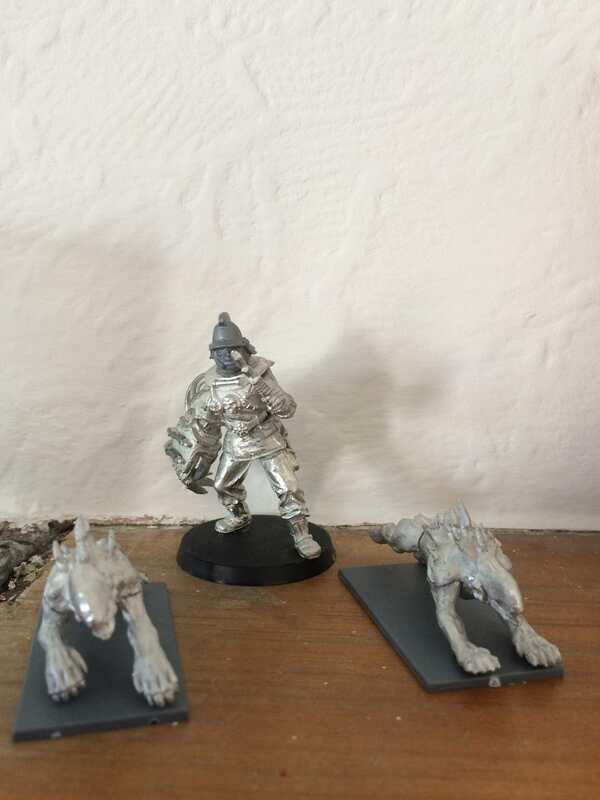 Got some time today to do gap filling on the slaver and his hunting dog things, and put together a couple of slave soldiers. They will have plenty of additional gubbins attached, and need to have some explosive collars added. I have decided the slaver will have an MIU to trigger the explosive collars should he feel the need... and if he has no brainwaves, then the collars will explode too! The ultimate dead man's switch. 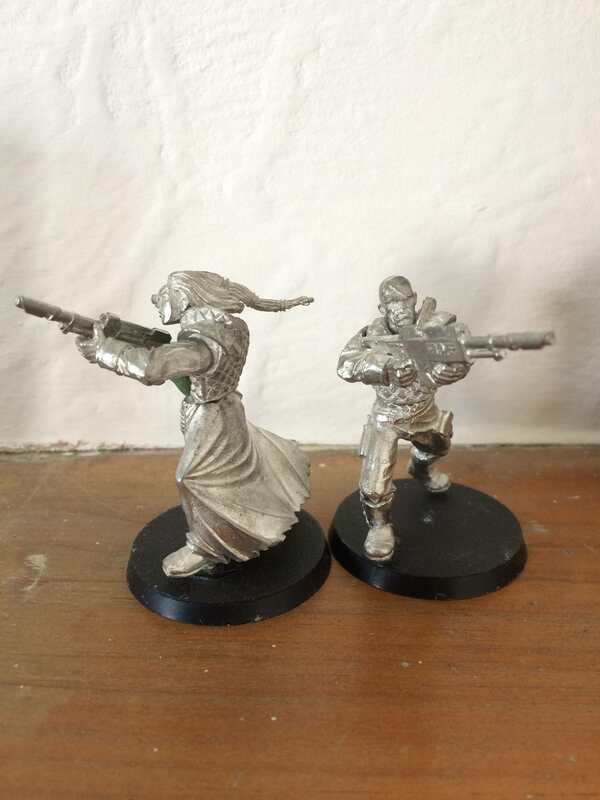 The two characters here are a former officer from the Imperial Guard, and a feral worlder. The officer hails from a noble family, and was accused of a crime she didn't commit by a rival officer from another noble house and sentenced to a penal colony. From there she was acquired as a slave. One day she hopes to be able to figure out a way to escape to seek her revenge. The feral worlder was one of hundreds enslaved from his home world by a slave vessel, and thanks to his ferocity has found his way to the soldiery, where the officer has taken him under her wing. An unusual pair, but both keen to pool their talents and escape their bonds. 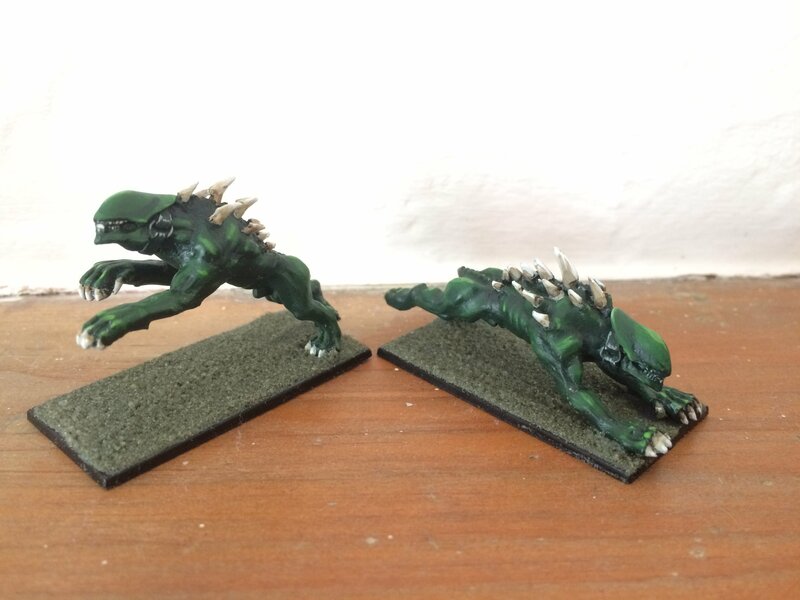 Well, I've ran out of time to get all the models done for the London GT. 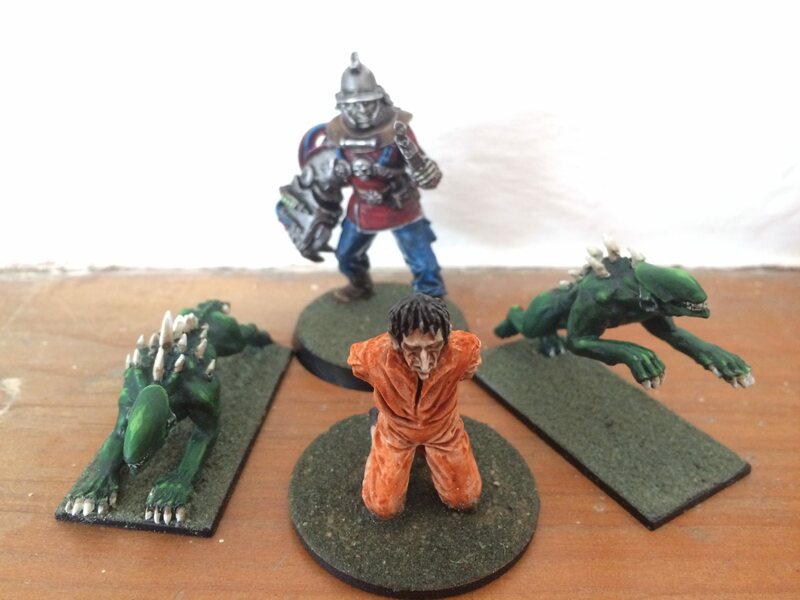 I have finished the slaver, his tracking dog-beast-things, as well as a prisoner and some rat swarms for the scenario I am planning to run on Sunday (though I still need to actually bring all my ideas together and write the damn thing). The models have all been painted much more quickly than I would have liked, and I have heavily relied on Army Painter washes. The bases are about as basic as possible (just green sand), but they are fine for NPCs. I may return to them and do a proper job eventually. I used Army Painter Platemail Metal as the primer for the slaver, and used bright and bold colours where I could. Dark Tone was liberally applied and some extreme line highlights to finish. The beasts were quickly done too. Sprayed Angel Green, I did some highlighting of the muscles with Snot Green and Scorpion Green. The spikes and claws are Drake Tooth highlighted with white and washed with Strong Tone. This is a Cliff Sanderson pirate, probably from the 80s, that I got on eBay ages ago. He has the weirdest shaped head. 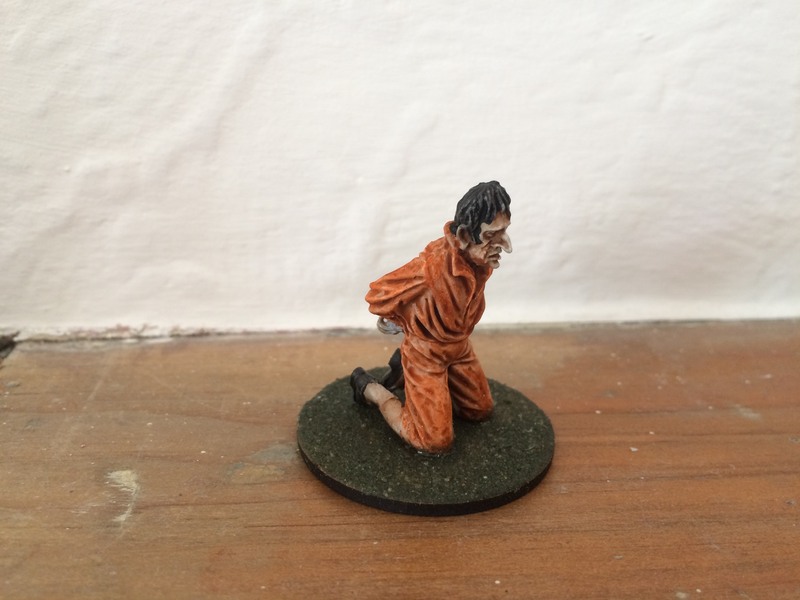 Orange wash over a grey primed, and white drybrushed base is all that went into the jump suit. Flesh wash on the skin and thinned black paint on the hair and shoes. 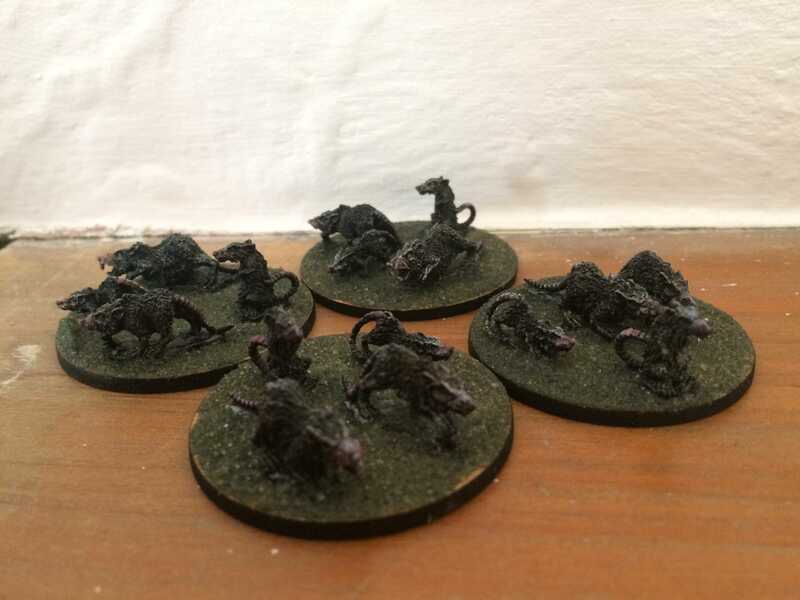 Not much to these: black, grey drybrush, red wash of tail and heads, Strong Tone wash of everything else. that slaver has really come to life with some paint. great color combo! The slaver is an inspired piece of work. Well done sir . For a quick paintjob this looks very good. I love the grayish skintone on the slaver.